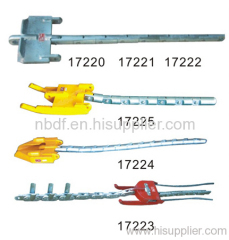 The Running board is used for connection of anti twisting steel wire rope with conductors. The whole set include the running board and swivel joints. It is used in stringing 4 bundled conductors. The vertical links hold running board in horizontal position for correct entrance into stringing block. It is used in stringing 2 bundled conductors. The vertical links hold running board in horizontal position for correct entrance into stringing block. Group of Conductor Running Board has been presented above, want more	Conductor Running Board and Running Board, Please Contact Us.